Hola Good Folks, today we’re talking COLD. After a long week of studio work and a bunch of gigs, I needed to clear out the internal ram with a little ocean time. We’ve had a series of storms with strong onshore winds passing through and I’d been out of the ocean loop for a week or so. Yesterday I woke up to sunny skies and a howling offshore wind and even though it was cold, it was time to get wet. I was frozen before I even got into the water. Once in the water it turned into a challenge to keep my head above the waves ‘cuz every time I went under I got one of those classic slurpee headachesyou know that feeling when you drink some frozen substance too fast. Brain freeze! But the coldest moments were coming out of the water to that chilly wind and riding my bike back homecomplete mind-blowing pain in my hands and feet. I haven’t been this cold since I was a kid in high school doing this exact same early morning surf in cold winds and then biking it home. Next, ten minutes in the warm shower and then life was back to normalbut actually better than normal. You kind of own the day after an experience like this and it’s all pointing in the right direction just to be warm and alive. That's my daughter Kylie owning the day out in the wild blue a few years back. 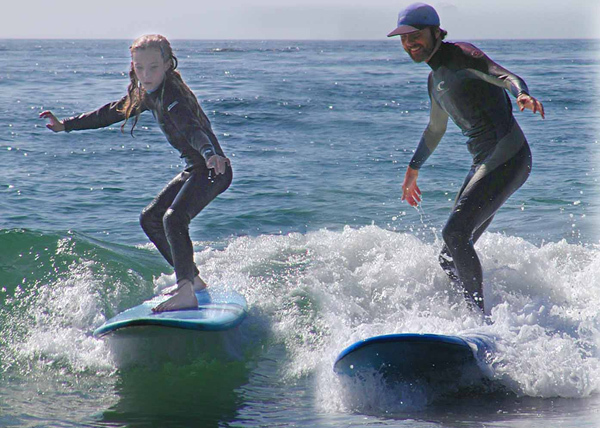 That's me on the right super stoked to be sharing a wave with the next generation. Staying warm even though it's cold. Today it’s warm and alive and I'm gearing up for a week of some cool music. 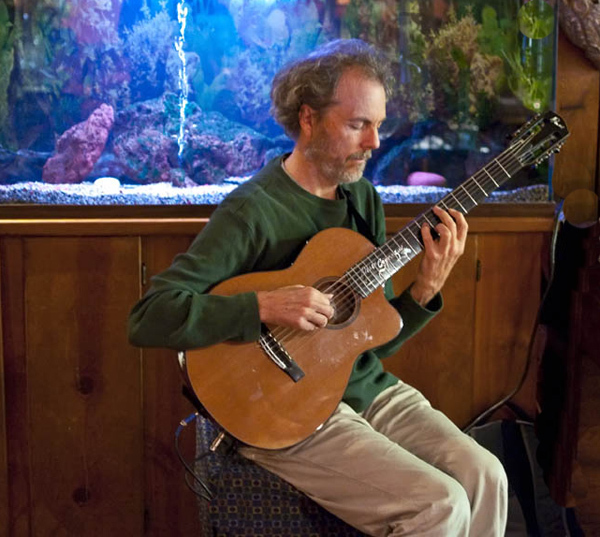 First on the list, I’ll be hanging at the L’Auberge in Del Mar tonight for some solo guitar travels. On Thursday night it’ll be further explorations into the six strings at the ultra cool Roxy in Encinitas. And the last hit of the week is Saturday night for a concert at the Pacific Beach Surf Shop. They have a whole event planned with food and an art exhibition and then US! It’ll be Kevyn on vocals, Gunnar on bass and me on guitar for a night of jazz and samba. We’ve done this gig before and it’s a real cool setup for music. See ya there! Me and the fish tank at the Roxy last week. That’s it folks and please check my whole updated December schedule below. It’s a great time to have frozen hands! 7:30 PM We're getting the Blur group together to play some music in an intimate setting. This is a really cool setup for a concert in the lovely home of John and Kim and it'll be a magical evening with some intermission desserts. Terryon Gulley  drums 7:30 PM A quick hit with the amazing Dianne Reeves. Gunnar Biggs  bass 7:30 PM Nina is a young artist who is currently schooling it at USC in the music department. She has a beautiful voice and composes some great tunes and this will be a special night of Peter's music, Nina's music, a few tunes by Joni Mitchell, The Beatles, Stevie Wonder and Cole Porter.